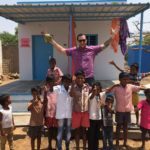 In March 2016, Corporate Giving Connection CEO Chris Hammond and COO Brandon McCarty traveled to India to see firsthand how donations are being spent by CGC nonprofit client Vicente Ferrer Foundation (VFF). As the founders of CGC, their mission is to help nonprofits connect with partners to increase their scale and impact. What they discovered while visiting VFF’s operations is a highly effective organization that serves as a true inspiration for others around the world. The three women entrepreneurs featured in The Empowered VR film. Chris & Brandon spending time with the people in the village. Brandon showing off his tattoos to the local children. 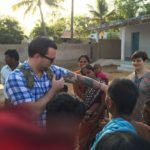 Brandon visiting with the village children in India. The local kids gather for a picture. One of the friends Chris made on the trip. 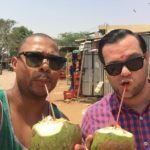 Phat X. Chiem, co-founder of Storycraft, interviewed Chris & Brandon about their experience in India. What is your connection to VFF? Brandon: We are thrilled to partner with VFF to launch its brand in the U.S. and share the amazing success stories from India. 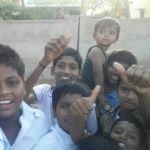 We wanted to witness firsthand the communities and grassroots organizations that VFF partners with so we can share these stories across the U.S. Our trip has inspired us to support VFF’s mission of eradicating extreme poverty in India in whatever ways we can offer. Chris: We’re looking to articulate VFF’s story throughout the U.S. While a picture may be worth a thousand words, nothing can replace what it feels like to travel and be a part of the community. It’s critical that we tell VFF’s story to as many people as possible. We can be the generation that ends extreme poverty, and supporting VFF gives us all a direct link to the people who most need the help. Had either of you visited India before? What perceptions did you have of India? 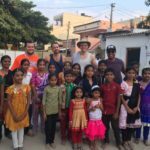 Brandon: It was the first time for both of us, but we didn’t go to India totally blind, having worked with VFF for six months prior to the trip. I would say the biggest impression for me was seeing the living conditions firsthand. In my experience hearing about poverty in developing countries, I always thought about Africa and Latin America. 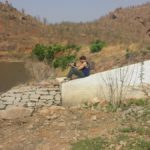 I did not anticipate the extreme poverty in rural India. 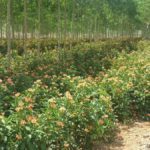 The most impressionable element is the contrast between metropolitan cities such as Bangalore and rural communities located in Andhra Pradesh and Telegana. Bangalore has the feel of what Silicon Valley was a few decades ago. 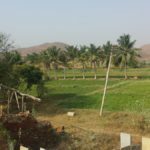 But Anantapur, where VFF headquarters is located, just a few hours away, is surrounded by villages without bathrooms and rudimentary infrastructure. From skyscrapers to mud huts, the contrast was striking. Chris: We had a good idea that we would see extreme poverty and different types of conditions. But the difference between each area was so polarizing. We would see it from village to village. 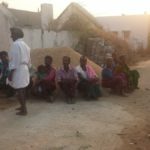 In one village, it was very obvious that VFF had made an impact. In another village untouched by VFF, the difference was night and day. Paint me a picture of the actual landscape. The area where VFF works is one of the driest districts in India. What does that actually look like? How do people live? Brandon: I grew up in Phoenix, Arizona. To me, it was very similar to Phoenix. But I don’t mean the developed parts of Phoenix. Imagine driving out into the desert and putting some villages there. The highways in India connecting major cities like Bangalore and Hyderabad are similar to what we see in the U.S., but when we arrived in smaller communities, there was nothing but dirt roads and “traffic” jams caused by sheep herders. Entrepreneurship can be felt in the air. What sticks out most are the mom-and-pop businesses selling convenience goods and clothes from their doorsteps that looked liked they would blow away if the wind blew hard enough. Chris: In many places, it was dry desert as far as the eye could see. But then, you would see a field of green mango trees that had been planted. And this was a field where VFF had helped the farmer irrigate the land and plant the crops. This was a consistent theme throughout the trip. We could clearly see evidence of VFF’s impact from village to village, field to field, whether it was housing, agriculture or the environment. You could see where VFF had partnered with communities and invested time and money into the area. It was rewarding to see the effects of the Foundation’s work translate into incredible outcomes in people’s life. 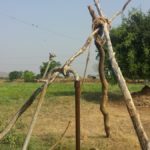 Brandon: In many cases, if it weren’t for the buildings, schools and homes built by VFF, there would be nothing around, except for straw huts without running water. A husband and wife in the fields they farmed. Give us a sense of the scale of VFF’s operations. 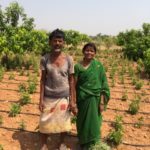 Brandon: VFF is focused on sustainability in both Telegana and Andrha Pradesh for small-scale rural farmers in and around Anantapur. VFF supports government schools, building upon the infrastructure that already exists to strengthen opportunities for the most marginalized. It runs schools, hospitals and agricultural programs. A local who spoke English came up to us and said, “VFF is the oasis of this desert.” He couldn’t stop talking about how the work of VFF has changed both his life and the life of so many people in his community. Everywhere we went, we were recognized as VFF supporters and, inevitably, each person who saw us, smiled like we were their friend. VFF has absolutely saved lives in this area. They have given hope. We spoke to women who, when they were young girls, their only hope was to have whatever leftovers their male relatives left behind to eat. Today, we ask them about the hopes of their children and they say, “They want to be doctors.” To me, this is the biggest achievement. VFF has been supporting dreams for almost 50 years. It takes time to eradicate poverty. Witnessing the impact of sustainable programs makes anyone who visits believe that we truly can be the first generation to accomplish this goal. The next generation now has opportunities that would never be possible without the Foundation. VFF is not about charity. It’s about empowering community partners to support their families and their communities. That’s what’s so beautiful about it. Chris: I absolutely agree. What we saw was that the people were so grateful for VFF. It was almost overwhelming. It is clear to me that it takes everyone in the village to make real change, and that is exactly what VFF does — uniting communities. They have over 2,400 employees and 99% of them are locals. The campus where all guests can have modest accommodations looks like a small college campus. Traveling to the VFF office allows visitors to experience the breadth of its programs, from the schools to the sports academy to the hospitals. Each community is inclusive of everyone and united to support each other. Brandon: The people don’t consider themselves charity cases. VFF doesn’t just give them technology or money. The communities identify their priorities and come up with the long-term solutions for themselves. Communities own the projects and manage the success. 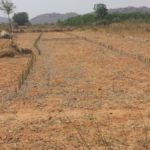 When VFF helps a village to build a dam, the entire village works together to match the funds through cash, in-kind donations, and the manual labor needed for the project. This creates a sense of ownership for communities, ensuring the success of every penny invested by donors. What stories are you still carrying around from that trip? Brandon: We went to a school for children with disabilities. We saw children facing so many challenges. Many of them were blind, and they were integrated with seeing children who did not have physical disabilities. Children with disabilities are often made into outcasts. Through VFF, they now have just as much opportunity as other children in the same school. 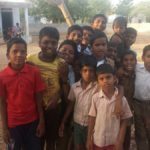 For a school to integrate these children and create lifelong friendships eliminates stigma was incredibly powerful to see. We also met a girl named Anji. She contracted polio at an early age and doesn’t have the use of her legs. When she was younger, she wasn’t allowed to socialize. She said her family loved her and took care of her, but whenever anyone outside of the family came to the house to visit, she wasn’t allowed out of her room. She said, “I wasn’t known as Anji. I was known as the girl with no legs.” Because she couldn’t use her legs, she would have to walk on her hands for two miles just to get to school and back. At the end of the day, her hands and legs would be bleeding with blisters. Now she has a job at VFF. Anji teaches in the VFF fair trade program where they create items like clothing and jewelry to sell. She teaches a class of 40 people with disabilities and shows them how to sew handcrafted products. Her students admire her. I’ve never seen anyone smile so much in my life, she was so happy. This epitomizes what our nonprofit client VFF represents to me. Chris: She was so full of life to be able to teach an important livelihood. It was contagious to see how happy she was to have this opportunity. I was also really moved by the Women’s Empowerment Initiative. We got to sit with a “sangham” or association for women. The members support each other by pooling their savings, sharing tools, and more. We met a woman named Sarojamma who owned a poultry farm. We learned a bit about her story. Like many women, she relied exclusively on her husband. Several years ago, he died and she became an outcast in society, because that is what often happens to widows in India. VFF helped her learn skills so that she could be the one to lead her family. Now she has her own poultry shop. Her family works there, too. Her son was cutting coconuts for us when we visited. This is a family that has overcome the burden of losing their sole breadwinner. Through the Women’s Empowerment Initiative, they were able to get the skills, talent and resources to start their chicken farm. They were able to get the necessary startup capital through the savings that donors contributed in the sangham. Brandon: The sangham works together to be a viable client for a bank. VFF helps them become numerate and literate so mainstream banks can’t ignore them and they can develop credit history. 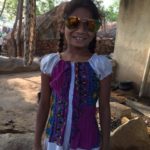 Finding the poorest of the poor in rural India banking, managing money, and investing in businesses despite the barriers of not being able to read because of the support of VFF is incredibly rewarding. 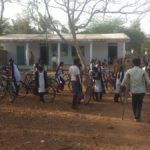 Local school girls with bikes provided by VFF. Local townspeople gathered to watch filming. The women of the village posing together. 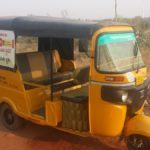 The rickshaw purchased with help from VFF. Kids watch the cameraman set up the drone. The rickshaw driver being interviewed for the VR film. Chris eating a picnic lunch with the crew. Corporate Giving Connection works with a variety of nonprofits with different approaches. Based on what you saw during your trip, what lessons do you take away from its work? Do you see VFF as a model for other NGOs? Brandon: VFF has built a system where it’s not just about doing one thing. It’s not just about giving people water. It’s not just building a house. These are all incorporated into the overall mission to eradicate poverty. VFF is really about creating sustainable practices. 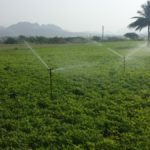 They teach people how to farm while making sustainable agriculture a top priority, as well as showing which crops can help improve their nutrition and income. They enhance language skills and technical skills so marginalized youth are more competitive for jobs. What can other nonprofits learn from take from this? Well, it would be really hard for another nonprofit to duplicate VFF’s success. Long-term solutions come with a community-led approach. To me, that is the biggest success – having the people of India run their own future and giving them the necessary tools to do that. There’s now a new generation of children that VFF has supported. Some of them are going to the top universities in India. Who knows what they will bring back to the community? Chris: I would say we came away with a true appreciation for the country and the people of India. People everywhere, no matter how rich or poor, are people who are working hard to give their children a better life. We are so impressed to learn about the tools our nonprofit client VFF has established to be the most. The people are an incredibly resilient group. 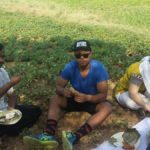 We are so thankful to experience the hospitality of the people of India. The whole experience was just so important and so powerful to us, and something that we’ll never forget. It was amazing to witness the changes that VFF has made in the last 46 years. I really want to see what VFF can do in the next 46 years. What we saw in those areas that VFF touched was beauty, to put it simply. VFF has created this incredible foundation. Now it’s just building on top of that. I’m really excited to see the progress continues, especially as our nonprofit client VFF becomes more known around the world and gains more supporters. Want to know more about VFF? 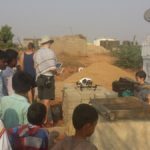 Read about the work done by CGC on behalf of nonprofit client VFF USA in the VFF Case Study, and watch the virtual reality film, The Empowered, that CGC produced on behalf of VFF while in India for this trip.